On April 6 1996, Larry Flick’s review of the single release of Madonna’s Love Don’t Live Here Anymore was featured in Billboard magazine. On November 2 1999, the Madonna: The Video Collection 1993-99 was released on home video and DVD. Madonna: The Video Collection 1993-99 was released as a collection of Madonna’s favourite videos from 1993-1999. The collection contains 14 videos: Bad Girl, Fever, Rain, Secret, Take A Bow, Bedtime Story, Human Nature, Love Don’t Live Here Anymore, Frozen, Ray Of Light, Drowned World, The Power of Goodbye, Nothing Really Matters, and Beautiful Stranger. On March 19 1996, Madonna’s cover of Rose Royce’s Love Don’t Live Here Anymore was released as the fourth single from her Something To Remember greatest ballads collection. 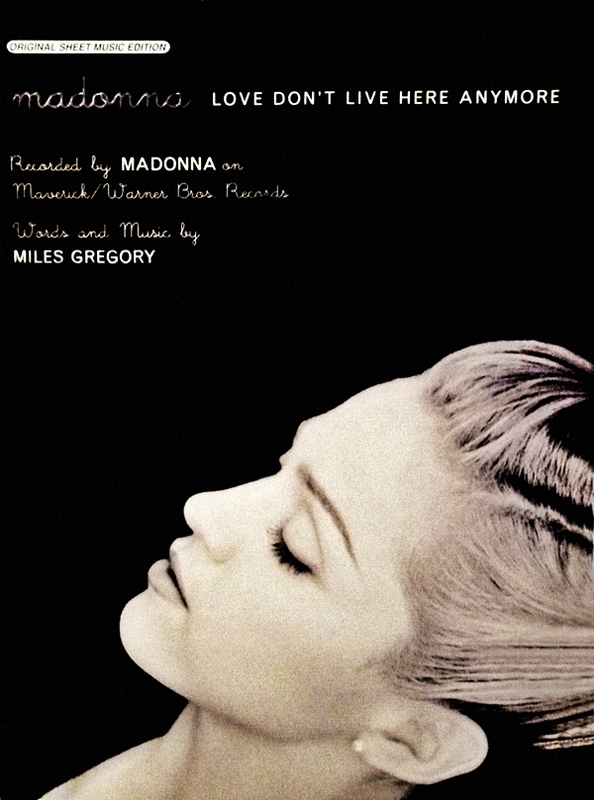 The song originally appeared on the Like A Virgin album. The idea to cover the song was Michael Ostin’s (head of the A&R department at Warner Bros. Records). “I had the good fortune of finding material that Madonna really responded to, Love Don’t Live Here Anymore for instance, which was the old Rose Royce record. I was driving into work one day and heard it on the radio, I called producer Nile Rodgers and Madonna, they were in the studio. I said, ‘I have an idea, you know the old Rose Royce record, ‘Love Don’t Live Here Anymore‘? 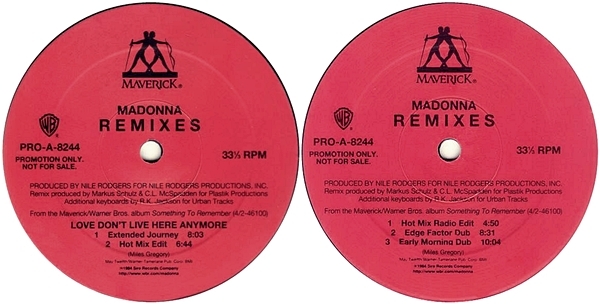 Why don’t you try and record a version of it for Like a Virgin?” Initially both Rodgers and Madonna were apprehensive of tackling an already well-known ballad, but in the last minute they decided that if Madonna wanted to bring diversity to the album, there could be no better song than ‘Love Don’t Live Here Anymore’. On May 6 1996, dance remixes of Love Don’t Live Here Anymore by Markus Schulz & C.L. McSpadden were released to clubs by Maverick Records on promotional twelve-inch vinyl & CD in the U.S.
Additional club remixes of the track by Mark Picchiotti were also issued in the U.K. as a twelve-inch white-label promo. On March 4 1996, Madonna’s Love Don’t Live Here Anymore music video was shot at the Confitería El Molino in Buenos Aires, Argentina, during her day off from filming Evita. The music video was directed by Jean-Baptiste Mondino, who worked with Madonna on her videos for Open Your Heart, Justify My Love and Human Nature. 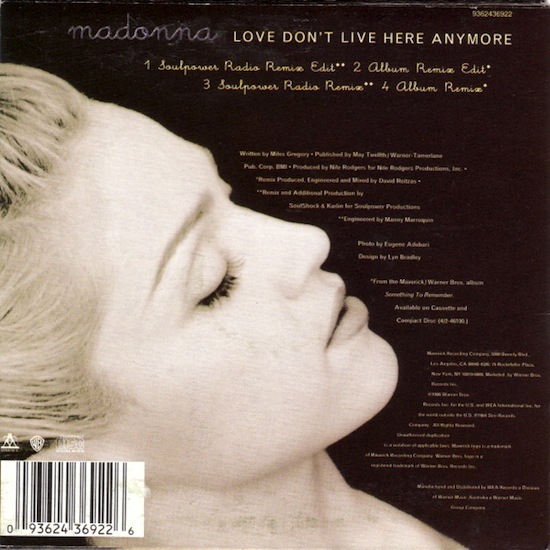 Love Don’t Live Here Anymore was released as the fourth single from the Something to Remember ballads collection. 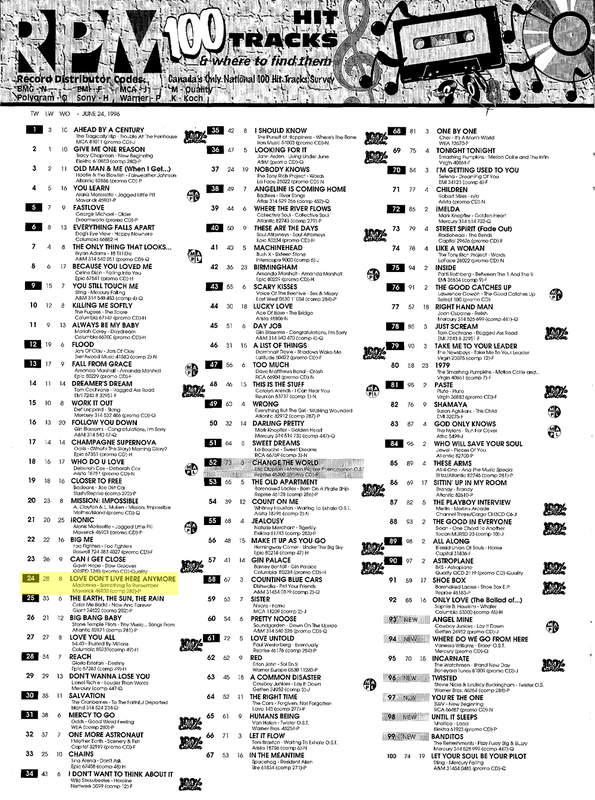 On June 24 1996, Madonna’s cover of Rose Royce’s Love Don’t Live Here Anymore peaked at #24 on the Canadian Top 100 Singles chart, which was then tabulated by RPM – Canada’s long-running music industry publication that folded in the year 2000. 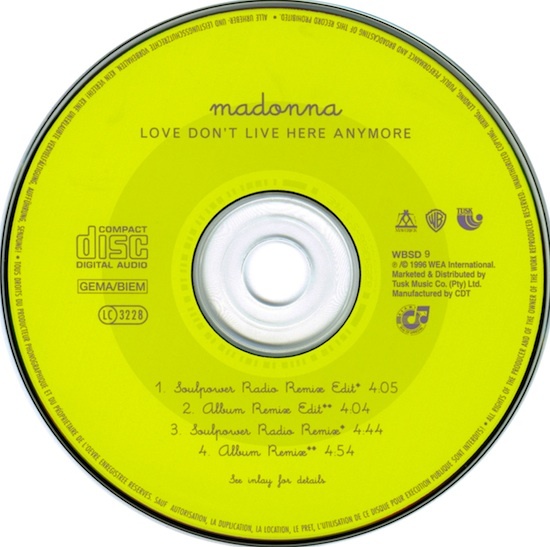 Love Don’t Live Here Anymore was Madonna’s only fully promoted North American single to not be issued commercially in any physical format in Canada until the release of 4 Minutes in 2008, by which point Warner Music Canada had ceased domestic production of physical singles and maxi-singles altogether (2006’s Jump CD maxi-single was the last). Considering this distinction, the song managed to perform respectably well on the Canadian Singles chart based on airplay alone. In the U.S., where it was available commercially on CD-single, cassette-single and 7″ single, it only manged to climb to #78 on Billboard’s Hot 100, becoming her lowest charting single to date at the time (excluding her first two singles, neither of which charted on the Hot 100).